Welcome to the Autumn Design Challenge and Blog Hop hosted by myself and Caroline Dewison of Blueberri Beads. Today’s participants will be showcasing designs made with a selection of THEA Elements and Blueberri Beads, beads and components that Caroline and I liberated from our own beads boxes and of course, we are playing along too. I wanted to pull the heart pendant out of the group and find a bronze component to complement it and since the aim of the challenge was to use our older components I had to have a good rummage in my rather large collection that is a mish-mash of things that may be a bit flawed, a little bit fugly, experiments that didn’t quite work first time around and quite frankly – some things that I have no idea as to why they are there! time I don’t know…maybe I did and just got distracted. So that left me with the set of beads…I was thinking that a bracelet was the way to go but I couldn’t find any of my own pieces that seemed to work well for that. What I did find was a couple of last seasons leaf clasps that I thought I could maybe put to a new use. As one was green and the other orange I patinated them both in an antique bronze and strung them on waxed linen with the beads along with one of Caroline’s birds and a matching bead I just happened to have in my art bead stash. I had a hank of tiny aged seed beads that were a perfect colour match so I threaded strands of these through the clasps and plaited them together to create a loose rope. I finished off with brass bead caps and another bronze wire clasp. So that’s my offering and I hope you like the designs and will join me in visiting all the other participants using the links below… I can’t wait to see what everyone’s done. Many thanks to everyone who has taken part in this challenge and of course to Caroline for hosting with me and providing such lovely beads to work with. Very pretty Lesley – I love them all – perfect autumnal designs. Thanks very much for including me in the challenge – I loved working with your wonderful bronze components. OMG I am completely in love with your first design, utterly stunning and beautiful don't quiet cover it!!! Really beautiful, Lesley! I love the earthly colors you've used! The first necklace is wonderful! 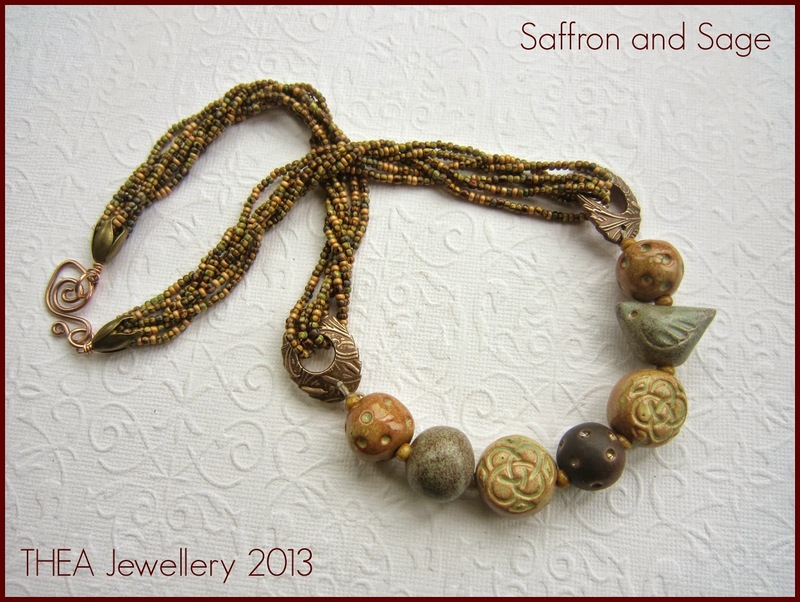 I love the design of the saffron and sage necklace. Really really pretty Lesley, you've made the most of Caroline's beads and your own designs. Thanks for setting up such a fun challenge! What beautiful fall designs! I really, really love how you used those leaf clasps, and those 'tossed together' earrings are awesome! Thanks so very much for this cool challenge! Beautiful designs Lesley! The first one is my favourite too, the bronze and heart look perfect together. You should definitely revisit the text connectors, they're brilliant! 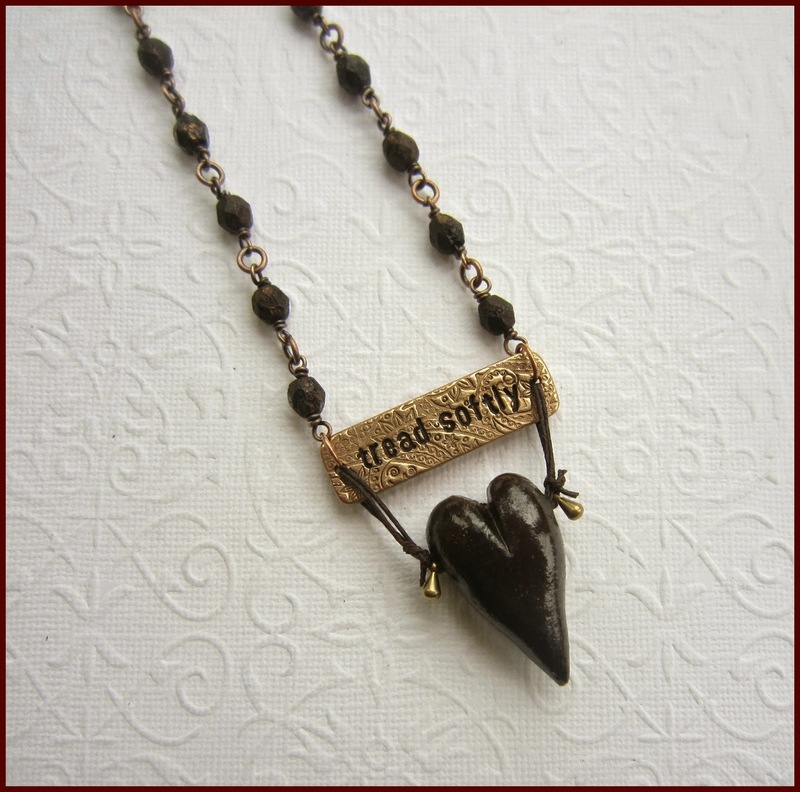 I love the Tread Softly necklace – funnily enough, as I was reading about it a song by David Sylvian was on, and he sang the words "I promise to tread more lightly." Funny timing. The second necklace is also very beautiful – but the first one really speaks to me. — My degree is in English Lit 😉 This has been a really fun challenge. It's been awhile since I've done one. I'm so glad I got to participate. Beautiful pieces!!! It's hard to chose only one favorite, but maybe I'd pick the second one – I like very much how you used the leaves clasps as connectors and I love that little bird! Thank you very much for this fun challenge!! Lesley, your designs are gorgeous, as always. I like the way you used the text connector. After the clean up it is just perfect. The czech glass also match wonderful. Love it. The second necklace is the perfect match. The clasps make perfect connectors. And I could wear those earrings every day. Lovely!! And thank you so much for hosting this blog, together with Caroline. All fantastic – I particularly like the Saffron and Sage necklace. I must begin saying that I understand why you kept that set for yourself, it is really gorgeous. That brown tones are super! I cannot say what I like the most… I just noticed the twist you made with your seed beads and now there is one thing more that I like. Thank you again for hosting this. It was really fun! All wonderful creations. The first necklace is beautiful and I love that it tells a story. 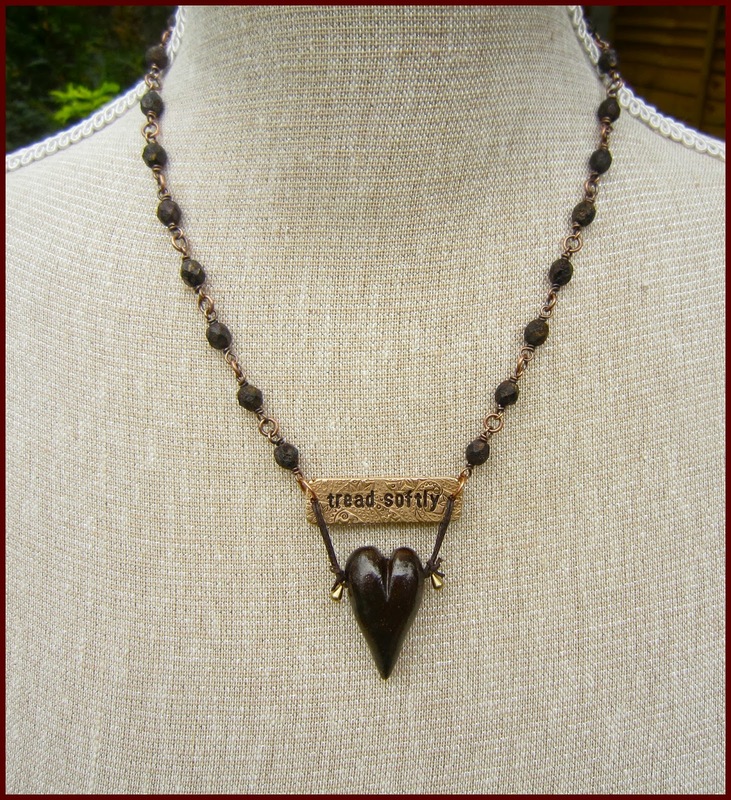 And Saffron and Sage necklace is just gorgeous!!! 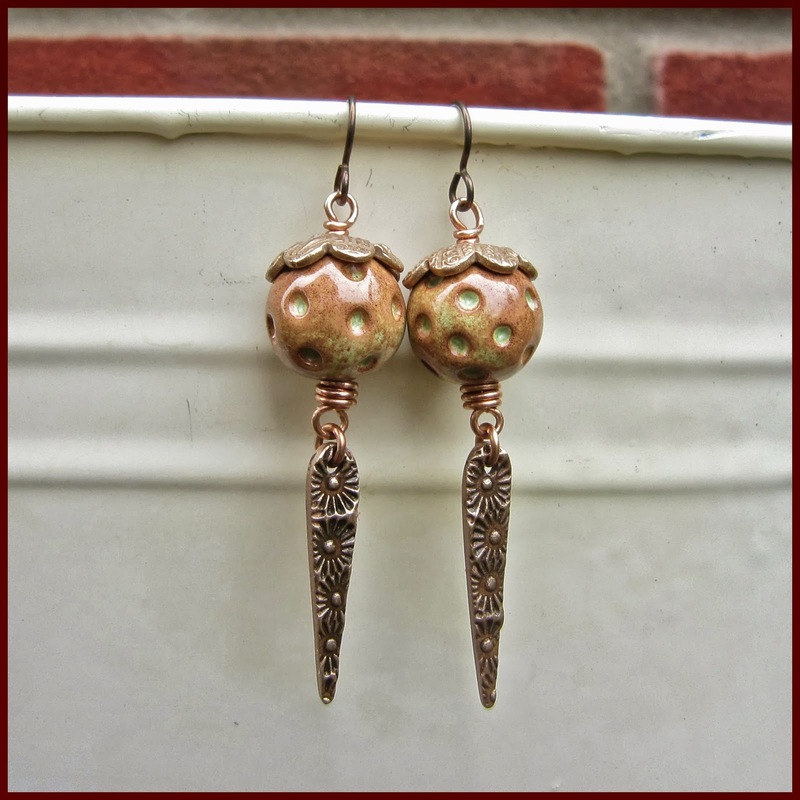 Thank you both for hosting this blog hop and sharing your wonderful beads so we could play. 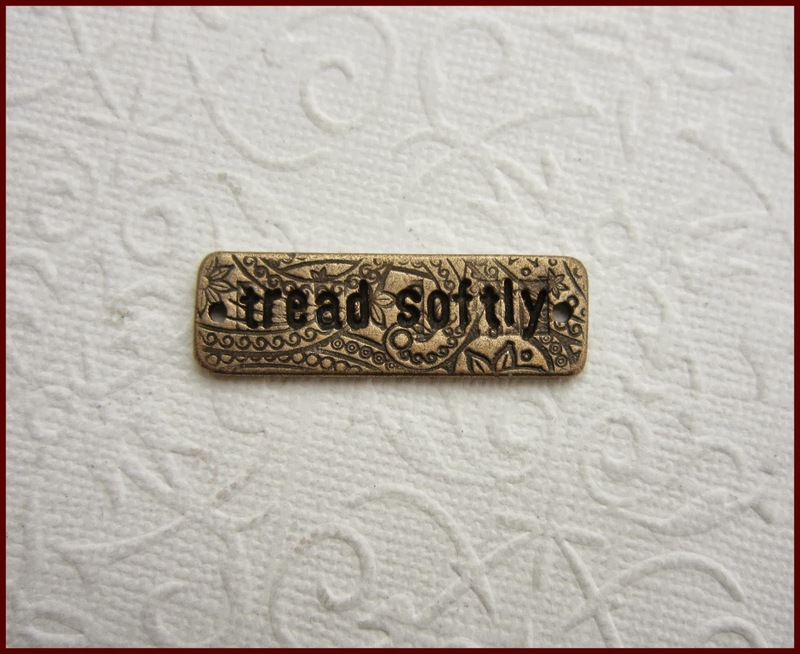 Your designs are gorgeous as always, and I really love the "tread softly" component. Just beautiful! 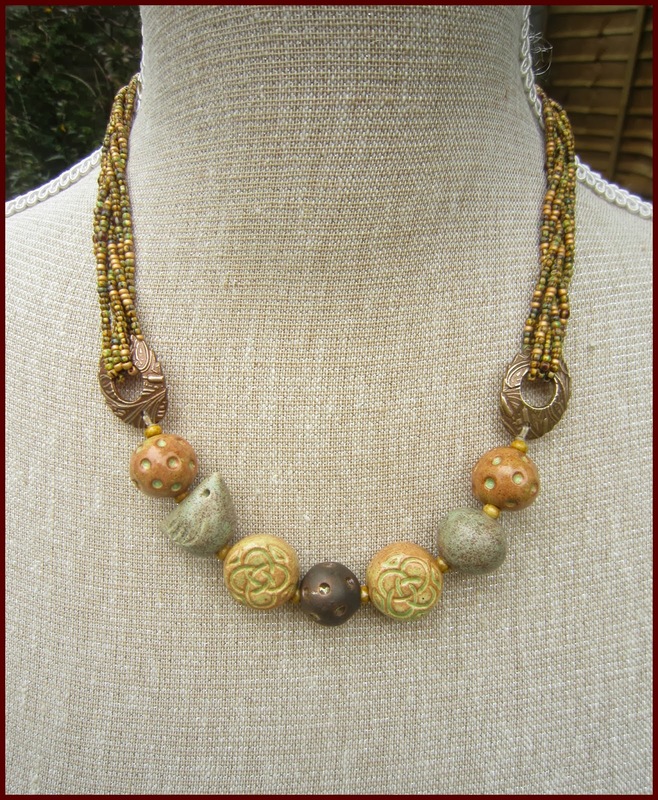 Love the earth tones! Thanks for the great challenge. I just wanted to squeal with delight over each one of these! Lesley – Thanks so much to you and Caroline for for hosting this event! It was a lot of fun. Your designs are so beautiful! 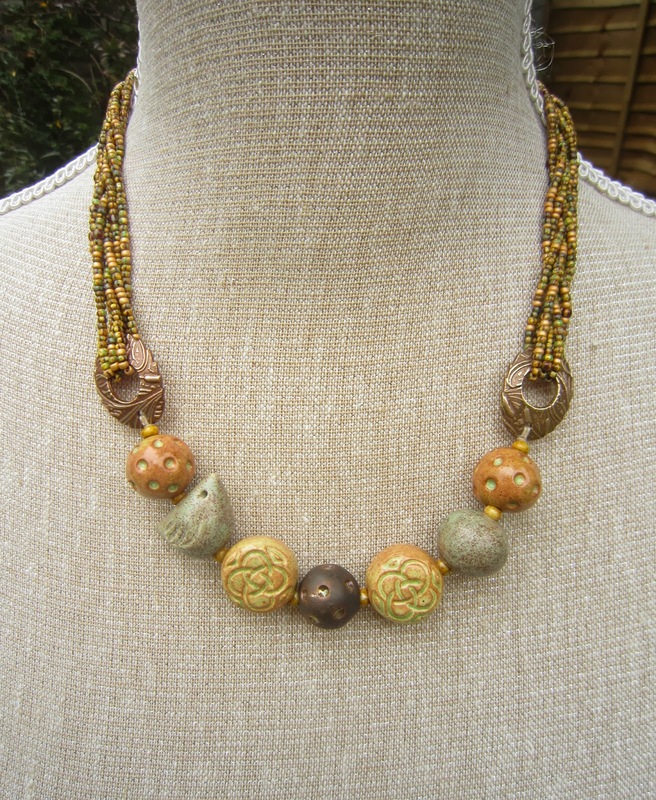 I especially love the Saffron and Sage necklace. The colors blend so beautifully. Beautiful art, as always, Lesley! I had to giggle a little out loud reading "a little bit fugly" in your post. 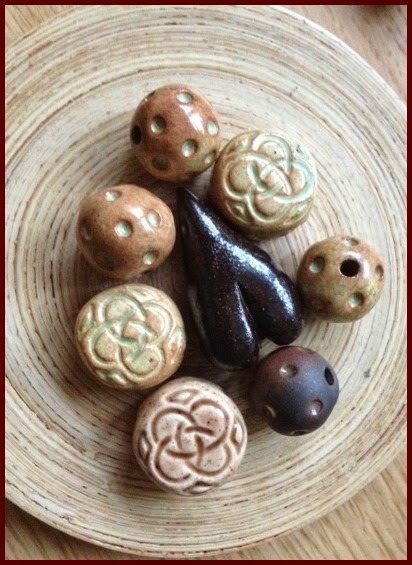 You've so successfully transformed special art beads into even more rare treasures. 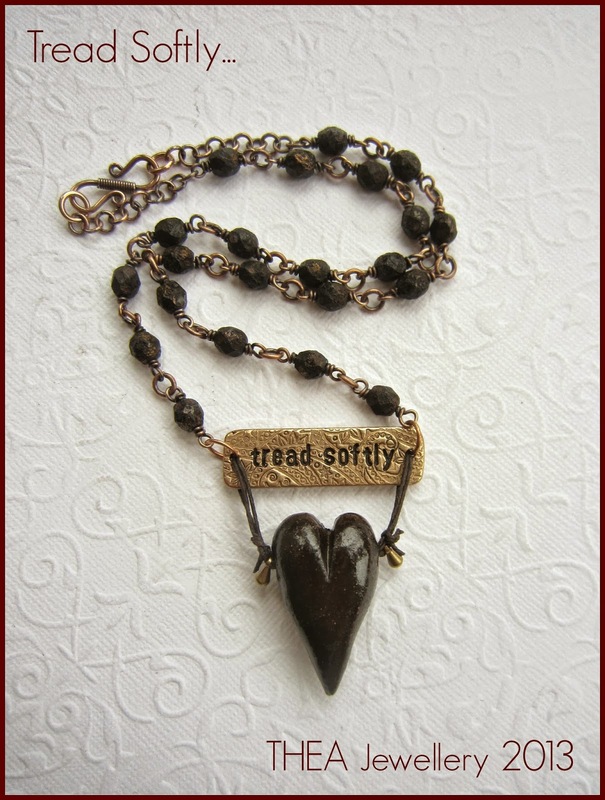 "Tread Softly" is a powerful piece, loving and open and strong indeed. Your lovely spirit comes through in the uplifting, connecting piece. "Saffron and Sage" is a delight for the senses, harmonious yet richly textured, flowing and full of beauty like a gentle and generous Autumn day. And your earrings are simply cool: an abstract leaf motif in the daggers is so smart, and the use of daggers symbolic of Fall's ending & also such popular shapes in chic Mexican & Latina jewelry design right now. What exquisite jewellery you've shared, and what bountiful harvest has manifested from you and Caroline's fantastic collaboration! Gracias & Bravo!